Identification: This species has a salmon-colored body with opaque white patches on the midline of the notum. The cerata are frosted in white and there are dusky steel-blue subapical patches on their anterior faces. The rhinophores have several irregular ridges and are flecked with white. The cephalic tentacles have apical and medial white bands. Very young animals lack ridges on the rhinophores and have more variable pigmentation on the cephalic tentacles. Natural history: Caloria sp. 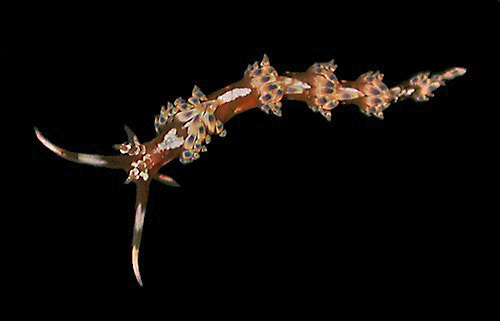 #1 is a moderately rare aeolid found in moderately exposed to highly exposed rocky habitats and in Halimeda kanaloana beds at depths of 5-8 m (16-26 ft). Taxonomic notes: It was first recorded in Hawaii by PF in Sept., 1989. Very young juveniles were formerly listed separately as "Unidentified Aeolid #21." Photo: PF: 11 mm: off Makena, Maui; Sept. 3, 2007.